This is one of the two types of tokens that can be obtained in Nagrand (the other one being the "Halaa Battle Token" http://www.wowhead.com/?item=26045). You can get a Research Token by turning in 20 units of "Oshu'gun Crystal Powder" (obtained as a random drop from the mobs in Nagrand) to the researcher in Halaa. The tokens can be traded in at the quartermasters in Halaa while the city is under the control of your faction, and reward you with rare quality armor for the leg and waist slots, an 18 slot bag, or an epic gem. These take so long to grind, it's unfair. I leveled up in Nagrand and pretty much every quest available, killing mobs all over. I even did the Kurenai grind to exalted. Add to this all the mote/primal i've done in Nagrand as well. After all this time i've got 10 tokens plus another 4 i spent on the PvP legs and belt. Thats 14 tokens from hundreds of hours spent killing mobs in the zone. If i knew how hard these things were to get when leveling i wouldn't have wasted 4 on the blue pvp rewards. I'm currently aiming for the Dark War Talbuk, yet i've had the PvP tokens sat in the bank for ages. It really does take a lot of grinding to get the Dark War Talbuk. At an average drop rate for the Crystal Powder of even 8% you'll get a stack of 20 after killing roughly 250 mobs. To reach the 20 you'll need that means you'll have to have killed 5,000 mobs that each have an 8% drop rate for the Crystal Powder. At a crazy fast rate of 5 mobs per minute, that'll take you more than 16 hours of solid grinding! I've currently got over 200 of these things sucking up space in my bank. I wish there was something useful i could dump them into, like health/mana pots you can get from Spirit Shards. 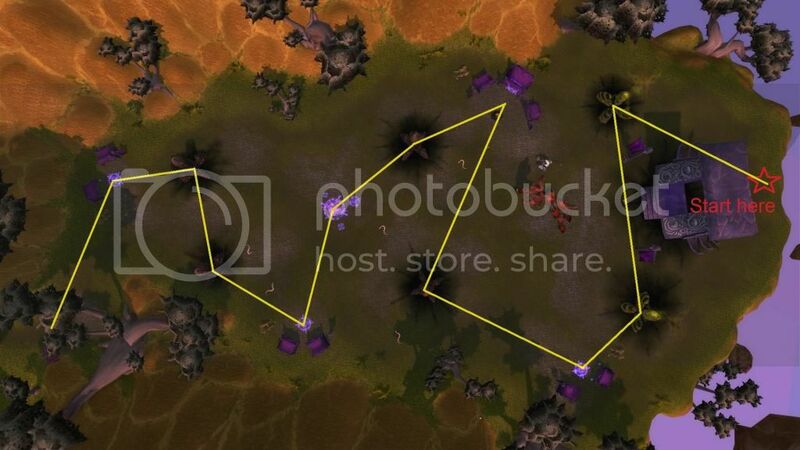 Best place to farm this is either the Broken Draenei in Sunspring Village (east of Halaa) or the Ogres in Laughing Skull ruins (northwest of Garadar); both are easily AoE'd. The Broken are less farmed (just occasionally someone doing the quest) and the small guys (scavengers) only have 1k hp and always come in groups of 3, but drop like normal mobs. Here is a post by LadyEnfinity on the Oshu'gun Crystal Powder Samples you need to gather to get these tokens. This helped a TON and I HIGHLY recommend you follow their words if you are going to farm the powders and not bother with the Warbeads for rep with the factions in this zone. I got 25powders in 20minutes just killing these mobs that they mentioned, and you will find it very hard to run out of mobs causing you to wait on respawns. "Forgot about these, wonder why I never got a Dark War Talbuk?" "Oh yeah . . ."
As the most recent poster said, I've also been postponing getting the mounts. If you want to farm these in a relaxing way and don't need these, go to Twilight Ridge which is all the way to the west. The mobs spawn in clusters of 4-8 and when you are done killing them you have to wait for respawns (3-5 min), which in my opinion is a good thing. I did test most of the other popular places and found this the fastest powder/hour, even with the wait time. These are now rewards from Garrison missions. I just got 100 normal Halaa Tokens, and 20 Halaa Research Tokens. Has anyone found where these can be spent? The vendor from the Outland certainly isn't there. The two vendors for this currency are in the middle of Nagrand At Halaa (Burning crusade version), Coreiel and Aldraan. Keep in mind these are pvp vendors, so your faction will have to control that area to be able to see them. Had to look this up after getting tokens from a garrison mission. Once you got both the mounts, the only useful items at lv 100 is 1 bind on pickup alchemy recipe and 1 bind on pickup jewelcrafting recipe and if you haven't got bigger; bind on pickup 18 slot bags, there is nothing else of interest for a lv 100 in the current content. I got to Halaa, waited until Horde had control, and found the vendor in the western building. However, I was pretty mad that he didn't have ANY mounts for sale. Disappointing. How do I find the mounts? If you already have everything you need from Halaa, use the tokens to buy and vendor Avenger's Waistguard for the most gold return. In Warlords of Draenor, you can get hundreds of these from follower missions. If you've already learned Reins of the Dark War Talbuk (100 Halaa Battle Token + 20 Halaa Research Token) and Reins of the Dark Riding Talbuk (70 Halaa Battle Token + 15 Halaa Research Token), there is no worthwhile use for them, and you may as well delete them. That goes for alts on the same battle.net account as well, since the mounts are account-wide. You could buy a bunch of Marksman's Legguardss for 40 Halaa Battle Token + 2 Halaa Research Token each, to vendor for around 5 gold each, but after you buy them, you can't sell them until you've been logged in for a cumulative total of 2 hours, otherwise they'll say "You may sell this item to a vendor with X min for a full refund", which gives you your Halaa battle tokens back. It's a hassle going to Halaa during the right faction ownership, and giving up bag space for two hours, which for most people won't be worth a few gold; just delete the tokens. If you've already got the mounts and have no idea what to do with the left overs (because you've been completing the garrison follower mission repeatedly), you might want to save the tokens. DOes anyone know if the Halaa research tokens has any relation with HeLa Cells? If You have bought everything You need with these tokens, but still have extra left (for example You keep doing garrison missions), to earn most money (highest gold per token ratio), buy Avenger's Waistguard, keep it in Your bags for 2 hours, and then sell it to any vendor.